Sure, we've seen message chairs with multimedia attachments before, in fact, we've even feigned intense interest in them at CES just to retain the privilege of lounging around for an extra 15 minutes. 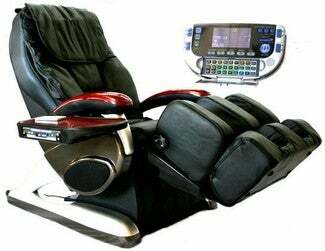 But this DF-1688F-3 DVD Massage Chair adds one element we hadn't thought of: It synchronizes its Dolby Digital music playback with the massaging. It's got balls, too—four of them that massage you from stem to stern, neck to waist and all points in between. While you watch its LCD screen, it's watching you with its infrared sensors that scan the curvature of your body, and it can detect "the exact acu-point unique to each individual," according to China Funsports, its manufacturer. Using that highly personal info, the chair knows exactly where to apply the just the right amount of pressure. Sorry, but we found no word on pricing or availability.